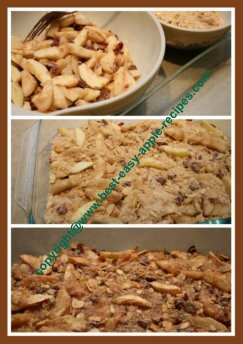 This Apple Pear Crumble Recipe, (see the photos! ), includes dried cranberries or craisins for a delicious warm fruit crumble for dessert! 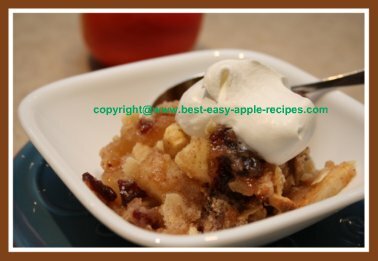 Our family LOVES warm desserts, especially if they are fruit crumbles! 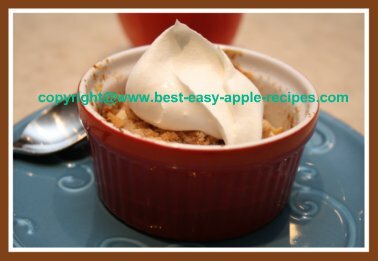 The Best Apple Pear Crumble Recipe! Making this crumble recipe will fill your home with a sweet, fruity aroma that will really get the taste buds ready for this treat! You can make this delicious crumble recipe in an 8" or 9" square baking dish, or in individual oven-safe ramekins. Grease, (I used non-stick cooking oil spray), an 8" or a 9" square baking dish. Or, grease individual ramekin bowls for this apple pear crumble. Peel, core, and slice the apples and the pears. In a bowl, combine the sliced almonds, flour, sugar, cinnamon and ginger (optional), using a fork. Add the butter to the mixture, and, using a fork, pastry cutter, (or use your fingers! ), combine ingredients and butter until the mixture resembles loose crumbs. In a large bowl, using a fork, mix together the flour, sugar, cinnamon and ginger (optional). Add the sliced pears and the sliced apples, the cranberries/craisins, lemon juice and the almond extract. Gently, using your hands, or a spatula, mix the fruit with the dry ingredients to coat, being careful not to break up the fruit. Transfer the fruit mixture to the baking dish. Sprinkle the topping mixture evenly over the top of the fruit. Bake at 375° F for about 30 - 35 minutes, or until the topping is starting to turn golden brown, and the fruit juices are bubbling up. Serve with whipped cream, whipped dessert topping or ice cream. If preferred, this pear apple crumble can be served cold.